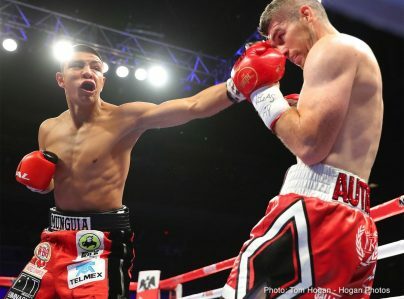 Jaime Munguia (30-0, 25 KOs) defended his WBO Junior Middleweight World Championship against former world champion Liam “Beefy” Smith (26-2-1, 14 KOs) via 12-round decision in the main event of HBO Boxing After Dark on Saturday, July 21 in front of 2470 fans at The Joint at the Hard Rock Hotel & Casino, Las Vegas. 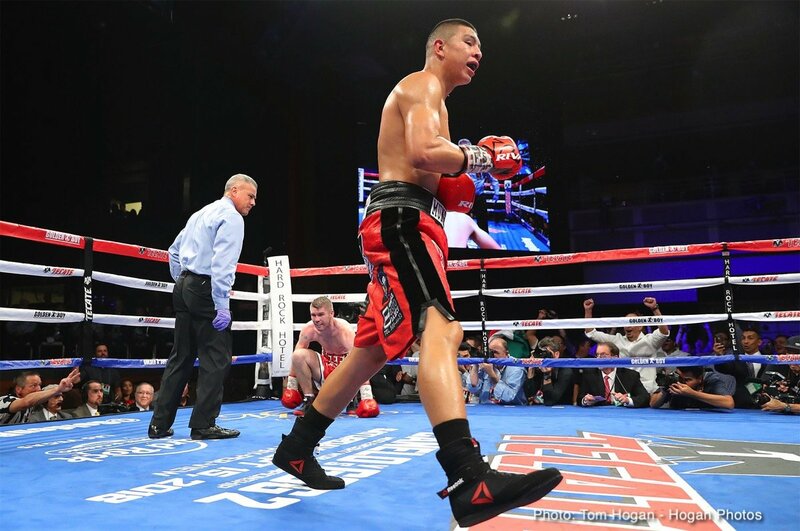 Munguia scored a knockdown with a counter left hook in the sixth round of a back-and-forth battle in which the native of Tijuana, Mexico eventually won with scores of 116-111, 119-110, and 119-108. 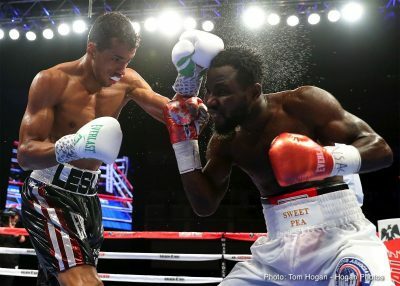 Alberto “Explosivo” Machado (20-0, 16 KOs) of San Juan, Puerto Rico, retained his WBA Super Featherweight World Title by beating previously undefeated Rafael “Sweet Pea” Mensah (31-1, 23 KOs) of Accra, Ghana via 10-round unanimous decision in tonight’s co-main event. 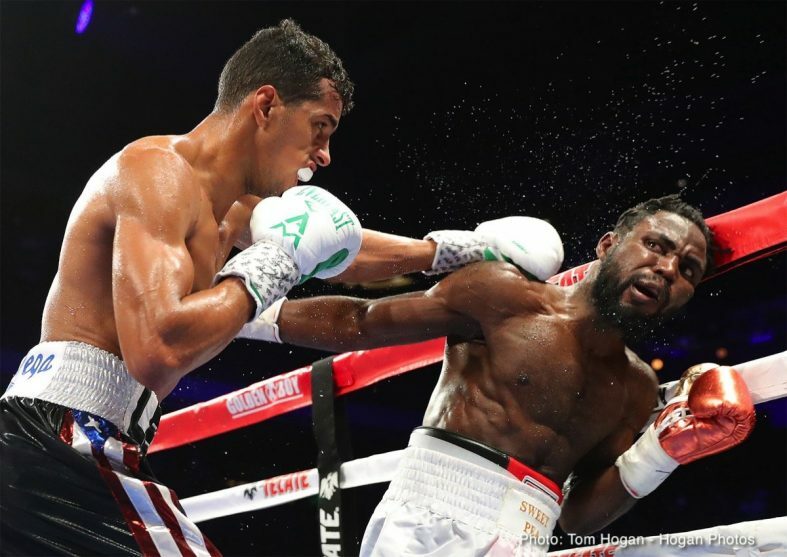 Machado dropped Mensah with a hard right hook in the first round and hurt him several times en route to earning three scores of 120-107. 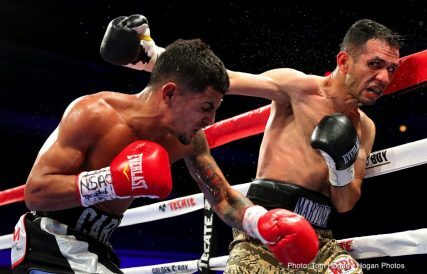 Yamagucho Falcao (16-0, 6 KOs) of Sao Paolo, Brazil scored a 10-round unanimous decision victory against Elias Espadas (17-4, 12 KOs) of Merida, Mexico in a middleweight bout. In what was very controversial battle, Falcao won with scores of 96-92, 96-92, and 95-93. 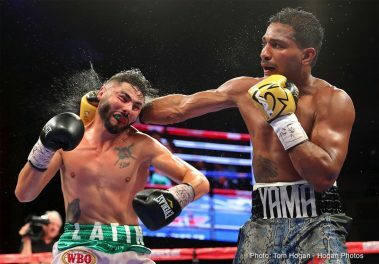 “We’re very happy for the victory,” said Yamaguchi Falcao.”My opponent was very tough. 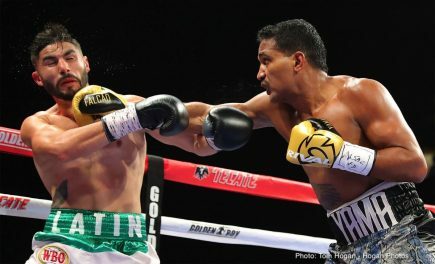 We appreciate the opportunity with Golden Boy Promotions. 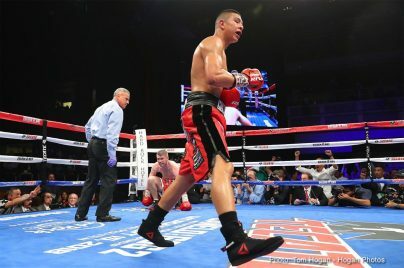 There were several stoppages by the official that we feel were not warranted because Espadas was ducking and coming with his head down. We look forward to the next opportunity. 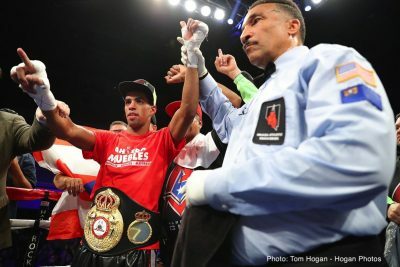 Puerto Rican prospect Carlos Caraballo (8-0, 8 KOs) passed his toughest test to date as he scored a fifth-round technical knockout win against Jesus Martinez (24-4, 12 KOs) of Monteria, Colombia in a super bantamweight battle originally slated for eight rounds. 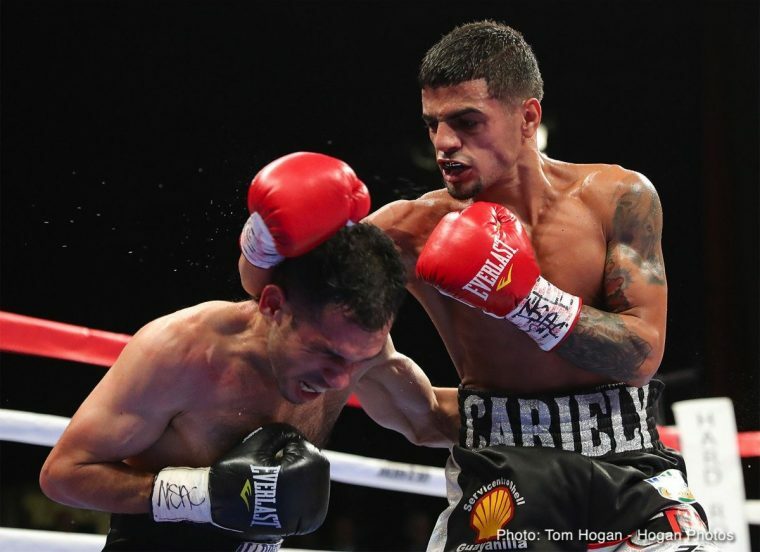 Caraballo fought a patient fight, wearing Martinez down until the fight was stopped by the referee at the end of the fifth round. 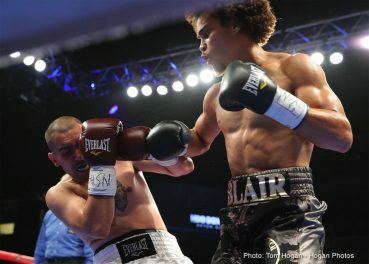 Las Vegas native Blair Cobbs (9-0-1, 5 KOs) scored a technical knockout victory at 1:52 of the second round against Emmanuel Valadez (5-5, 4 KOs) of Agua Prieta, Mexico in a scheduled six-round super welterweight fight. 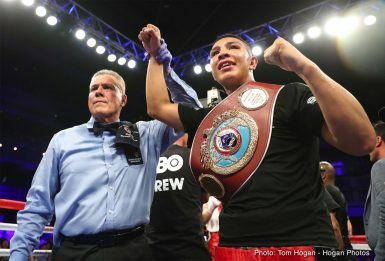 Munguia vs. Smith was a 12-round fight for the WBO Junior Middleweight World Championship presented by Golden Boy Promotions in association with Zanfer Promotions and Frank Warren. 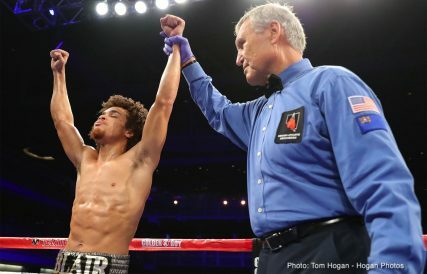 Machado vs. Mensah was a 12-round fight for the WBA Super Featherweight World Title presented by Golden Boy Promotions and Miguel Cotto Promotions in association with Don King Productions. 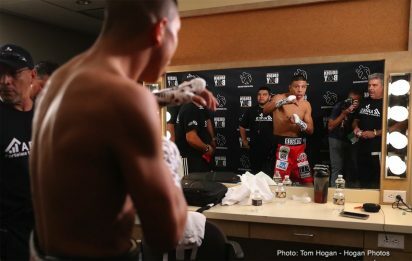 The event was sponsored by Tecate, “THE OFFICIAL BEER OF BOXING” and Casa Mexico Tequila. 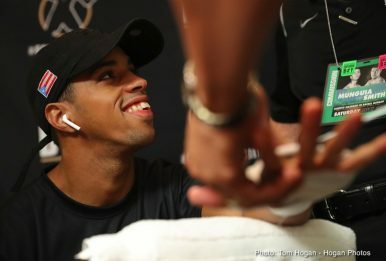 The event took place on Saturday, July 21, 2018 at The Joint at the Hard Rock Hotel & Casino, Las Vegas.